Do you have a story to tell, a recipe to share, a skill to teach? The Guest Writer blog is the place for you. Please email us at usstatesblog@gmail.com to submit your articles. The articles we publish on this blog will include a link back to your website or blog. “Rick Henry’s Jazz Art” by author and graphic designer, Rick Henry, is a book that combines his original, digitally rendered graphics and photos with his love for jazz musicians. Each graphic is accompanied by a one-page summary of highlights about each jazz musician. The digital enhancement of each graphic creates visuals bursting with rich colors and unusual depth. What I especially like about this book is the strong visual focus that directs our senses to appreciating jazz musicians from a different perspective. It’s a fascinating concept. I wanted to better understand how this idea came about and Rick’s thinking process to make it happen, so I asked him a series of questions about this project. I hope that his responses also answer many of your questions, too. Irene Economou (IE): Rick, there are a lot of books today written about jazz musicians, but none that I have seen that combine the concept of using a graphic visual to associate with a jazz musician. What was your inspiration for making such a book that focuses on what you are calling jazz art? Rick Henry (RH): It really was a case of happenstance. I was looking at one of my Facebook photo albums that I call "Rick's Jazz Art." This is a place where I keep some of my more unusual or abstract digital art. 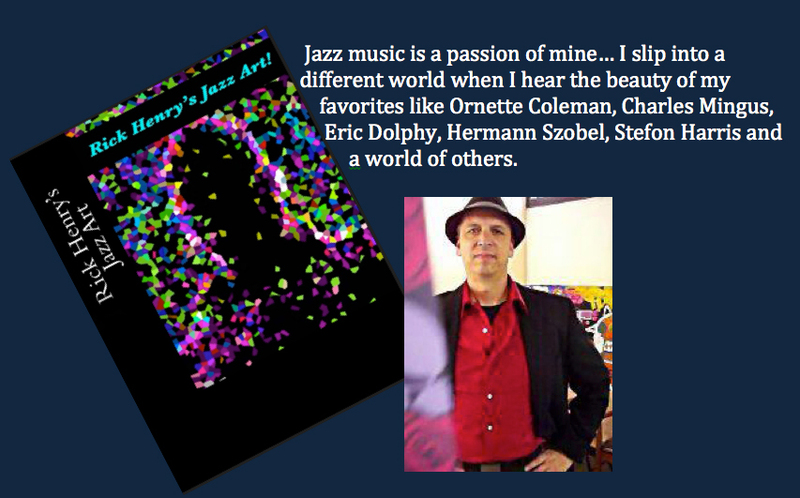 At that time I thought that I would really enjoy making a book containing jazz art created with drawings and photographs that I edited with digital software that were dedicated to my favorite jazz artists. IE: The experience is somewhat esoteric, isn’t it? What is it about jazz music that speaks to your soul? How exactly does it make you feel? Is it only jazz, or can you get this feeling with other kinds of music? RH: It's the overall feel of the music, the blending of instruments that just seeps right into my heart and soul. Yes, other types of music also reach into my inner being, especially many forms of alternative rock. A good electric guitar part can always send me to that point of "chill." IE: There are so many jazz musicians, both past and present. Rick, how did you decide on the ones that you chose to focus on? RH: I wrote the names of about 70 of my favorite jazz musicians on raffle tickets and put them into a box and randomly chose 24 names. Those are the ones that ended up in my book. I also chose the order in which they appear in the book in the same way with the exception of Miles Davis. I reserved the last two pages of the book for him, because Miles is the most influential jazz musician of all-time. IE: You mention in the introduction of your book that it was Ornette Colman that first intrigued you in jazz music. Is he your favorite jazz musician? If not, who would you say is your all-time favorite? What makes him/her top of your list? RH: I love too many jazz musicians to have a favorite, but Ornette is in my top ten. He was my first exposure to real jazz music. I discovered him in 1981 when I was working in a music store. One of the guys that worked there used to play Ornette quite a bit, and his avant-garde style really caught my attention. IE: I saw a documentary recently about jazz musicians, and I remember that Ornette Coleman was viewed as being very progressive and a real game changer. RH: Yes, that is one of the things I love about Ornette. I have always been attracted to cutting-edge, game-changing music. IE: In your opinion, how does jazz music today compare with jazz music in the past? RH: Great jazz music is great no matter what era it was made. I do feel that the 70s is jazz music's greatest decade. That's when it reached its artistic and experimental peak. But really there is a lot of great jazz music being made today. Mind you, I do not consider easy listening, instrumental music to be jazz. There is a big difference between true jazz and easy listening. IE: Do you feel that jazz music is timeless? RH: Yes! But isn't that really all about one’s personal taste in music? IE: I suppose you are right about that. We are the ones that determine what music is timeless for ourselves based on our own perspective and choices. I see your point. Moving on, how familiar are you with each of the jazz musicians you are featuring in your book? Do you own works performed by each of them? RH: I own music of all the musicians in my book and have a musical bond to each of them. I am very familiar with the music of each of these 24 musicians. IE: That’s awesome! Tell me more about the photos/original art you included in this project. Did you create new pieces for your book, or did you work with existing artwork and photos and modify them? RH: All but one of the images are new creations made specifically for the book and each musician. IE: I’m curious as to how you matched the graphics with each musician. Was it based on a feeling, or did you know something special about a particular musician that drove the design process and matching? RH: All the images were based mostly on the actual music itself, and the colors and moods of what I sense from the music. Now, on the other hand, the image for "Brother Jack McDuff” was based mostly on his love of food. IE: I have to admit that photo of the peas, potatoes and tomatoes that you used for Jack McDuff is very appetizing!! Continuing with this thought, Rick, would you pick a few other examples from your book and tell us why that particular graphic was paired with the given jazz musician? RH: Certainly! For Twin Danger, I created an image that has a sort of dangerous look to it. It has low, blue flames of fire surrounding two (twin) circles of emptiness. In thinking about Thelonious Monk, I find that his music is somewhat rustic, yet sensational. The image with the water bottles emphasizes the feel of everyday life, yet it is encased with abstract colors and a dramatic red background giving the image a sort of sensationalism. When it comes to Hermann Szobel, his music is out of this world, cutting edge and a universe all its own. IE: Some of your photos/graphics focus on objects that are easy to identify. But many of the photos fall into the realm of abstract art. What are the objects in each of the abstract photos? RH: That's just it! The objects in the more abstract images are no more than abstract drawings of abstract feelings. IE: Thank you for reminding me that feelings can be the inspiration for an artist's creation. I like how you styled the book to be two pages per musician, with one page as the visual graphic and the adjacent page highlights of the musician, with concise details that include the genres, highlighted albums, collaborators, nicknames, and interesting trivia and facts. I also like your use of bright, colorful backgrounds for each of the pages, too. It’s very appealing done this way! RH: Thank you! It looked good to me so I went with it. I always attempt to design text so that it is easy and quick to read. IE: The cover of your book is especially intriguing. I think it’s pretty cool! What can you tell us about it? What are the steps you took to arrive at this design? RH: Believe it or not, I was actually trying to take a photo of my car battery, which is in my trunk. It was starting to get dark outside, but I decided to take the photo anyway. When I looked at the photo, instead of seeing a battery, I saw a picture of just the shadow of my head. I realized that I had accidentally changed the camera orientation to take a selfie photo. I thought it was pretty interesting and unexpected, so I decided to work with it. I uploaded it into Photoshop and with my iPhoto editor added the other particles of the image – multiple colors, confetti, etc. IE: That’s pretty funny, Rick! Accidental photos can be amazing. I’m glad you decided to be flexible and spontaneous with the photograph that you ended up with because the final resulting cover is pretty outstanding! Looking into the future, I understand you are planning to do a sequel jazz art book that will include more original graphics and photos and different jazz musicians. What is your estimated timing for it? RH: The sequel will most likely be released in late 2017. Right now I am working on two books, one about my mom called "Tears for My Mother" and a Donna Summer album-by-album book. After those two are completed I will start working on a Pink Floyd book along with Jazz Art II. IE: Wow, you are going to be one busy person! RH: Going to be? I already am busier than ever... and here I was going to try and lighten my load. IE: Thank you, Rick! This was extremely informative! I have been enjoying “Rick Henry’s Jazz Art” very much and have it out on display on my coffee table for guests to enjoy. I also purchased two extra copies to give, as gifts to a couple of my friends that I know will enjoy the photography as well as the info about these musicians. Your next few projects sound very interesting, too. I will look forward to seeing them as well as your next book on jazz art. Best wishes on all of your projects, Rick!